BOISE,Idaho ? Space Exploration Technologies(SpaceX) is making minor software modifications on its Falcon 9medium-liftrocket in preparation for its second flight, now targeted for October,based onissues encountered during the vehicle's successful debut in June. Improvementsto Falcon9 hardware have been under way since the company completed aninternalanalysis of the vehicle's maiden launchfrom Cape CanaveralAir Force Station, Fla. A videotape of the launch posted on thecompany'swebsite shows the rocket rotated several degrees as it left the launchpad. Ina Sept. 2 e-mail, SpaceX spokeswomanKirstin Brost said engineers are "tweakingthe engine gimbal angle in software" to correct the problem.Anotherfix in the works involves relocating a liquid oxygen drain outlet thatcontributed to a second-stage roll captured by an on-board camera thattapedthe launch from liftoff to orbit insertion. "Thesecond-stage roll is being fixed bychanging the location of the [liquid oxygen] pump drain outlet to avoidchilling the hydraulic lines of the roll control actuator," Brost said. Themaiden Falcon 9 mission was funded by aU.S. government agency that SpaceX has declined to name and carried aqualification unit of the company's Dragon space station cargo capsuleintoorbit. The next three Falcon 9 missions will carry Dragon in anincreasinglycomplex series of demonstrations under SpaceX's $278 million CommercialOrbitalTransportation Services (COTS) agreement with NASA. Upon successfulcompletionof the demo missions, SpaceX will begin making regular cargo-deliveryruns tothe international space station under a separate contract valued at$1.6billion. 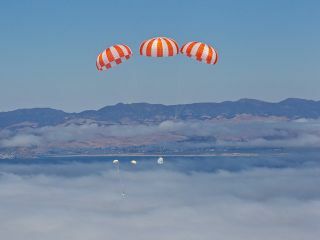 InJune, SpaceX founder and Chief ExecutiveElon Musk said the company had proposed combining its second and thirdCOTSdemos into a single mission. Under the current plan, the second COTSflightwill be a five-day mission during which Dragon would approach within 10kilometers of the space station and demonstrate the ability of thestation'screw to receive telemetry from the capsule and send commands. On thethird andfinal COTS demo, Dragon is supposed to berth to the station for thefirst time. InAugust, Alan Lindenmoyer, head of NASA'sCommercial Crew and Cargo Program Office at the Johnson Space Center inHouston, said the agency is considering the proposal, but that adecisionawaits the outcome of the first COTS mission. "Wehave to go through the technicaldetails ? because it's important to complete the demonstration ofcontingencymaneuvers with the vehicle before we actually complete berthing withthestation," Lindenmoyer told SpaceNewsAug. 19. "We need to understand is it possible for SpaceX to conduct amission that completes all those prerequisites ? such as breakoutmaneuvers andmultiple rendezvous and station-keeping ? and still achieve aberthing." Musksaid in June that if the proposedcombined demo is unsuccessful, a third COTS mission could serve as abackup.But if his plan works, the combined demo would clear the way for SpaceXtobegin delivering cargo to the space station under the CommercialResupplyServices contract it signed with NASA in December 2008. AlthoughFalcon 9's debut was supposed tohave happened in 2007, with the first space station resupply missionslated forthe end of this year, hardware development has taken longer thanplanned. Brostsaid the company recently asked theU.S. Air Force's 45th Space Wing to reserve Oct. 23 at the launch rangefor itsfirst COTS mission. In May, the company said subsequent demonstrationflightshad been pushed from fall to spring, and Brost said the need foradditionaldevelopment work on space station proximity operations and berthing, aswell asfinal certification by the space station safety review board, makesthoselaunch dates difficult to predict. "Weare hopeful that we can berth withstation before next summer, but development programs need to allow fortheunknown," she said. NASAspokesman Joshua Byerly said delays withnew rockets and spacecraft are to be expected. "Theupcoming test flight is much morecomplicated since it involves not only the Falcon 9 rocket, but alsothe Dragonspacecraft," he said in an Aug. 11 e-mail. "So you are talking abouttwo brand-new spacecraft." Byerlysaid it is unclear how SpaceX's COTSdemo schedule might affect its space station resupply missions. "Itis too soon to tell whether thecommercial resupply flights will be impacted, but we will continue tomonitorthe progress of our partners," he said.